Kabbalah examines the very origins of creation. In the Kabbalah, G‑d is referred to as the Ein Sof; meaning the Being that has “no end.” In the act of creation, G‑d made something very finite out of the infinite. How did this come about? While some Kabbalistic texts speak of a gradual contraction of Divine Power as it streamed into this finite world, eventually reaching a point of complete concealment in this world, the Kabbalah of the Arizal, however, held a different view. According to the Arizal, there was a quantum leap from infinite to finite, calling this leap of states Tzimtzum (contraction). In order to visualize how this happens, the Etz Chaim of Rabbi Chaim Vital presents the following structure. The power and ability of the Ein Sof is called the Or Ein Sof (the Light of the Ein Sof). Because physical light is perceived as being ethereal and intangible, and because light gives life and warmth, it is often used in Kabbalah as a metaphor for Divine Power. In the initial stage of revelation, the prevalent manifestation was that of the infinite Light. Contained within the Or Ein Sof in a most sublime way was the potential for finitude, however initially it was undistinguished from the powerful manifestation of the Or Ein Sof. In order for creation to take place it was necessary somehow to conceal this infinite Light, thus creating a vacuum for the Finite Light to be revealed. One may draw an analogy to a ray of light from the sun. While it is within the sun, the ray has no independent identity because it is totally nullified by the greater light of the sun itself. Only when the ray has left the sun can it be recognized and perceived as having an independent identity. For the genius to communicate with the child’s mind, it is necessary that he put to the side all the theories and complexities of advanced mathematics and to focus on basic addition. In time, the child he is teaching may progress to study mathematics in high school, college, and then university. The student may even become a professor of mathematics himself, and may even surpass Einstein in brilliance. However, in the first stages the end product was concealed. The same is true with regards to Tzimtzum–G‑d purposefully drew back the infinite to create a space in which finitude could be realized. This concealment of the Or Ein Sof is called by the Arizal the Tzimtzum HaRishon. This “first” Tzimtzum was the most radical in the sense that it was the quantum leap that allowed finitude to surface. It must be noted that the concealment of the Or Ein Sof did not affect Atzmut itself, for Atzmut is the essence of G‑d which transcends everything, including changes. Hassidism explains that what was left after the Tzimtzum were the “letters of the residue” (Reshimu). The Zohar states that “He engraved letters in the supernal purity” (i.e. in the Or Ein Sof). This means that when it arose in G‑d’s will to create the world, “G‑d measured out within Himself in potential what would exist in actuality.” In the Zohar, this act of measuring out is referred to as “engraving letters.” These letters signify the structuring and formation of the Divine will prior to the Tzimtzum. They are the potential for limitation that existed within the Or Ein Sof. Explained another way, in order for finitude to take on parameters and definition, there had to be some form of definitive language. These dimensions are called letters. Letters are the building blocks of words which can build sentences, speak a language, and subsequently communicate. The Kabbalah calls these letters “Vessels” (Kelim), and the meaning within the words “Lights” (Orot). Every sentence is composed of letters which are the Vessels for the meaning of the sentence, and the message conveyed which is called the Light (Or). The revelation of Vessels came about through the Tzimtzum, although they existed in an abstract form before the Tzimtzum. As previously stated, within the Or Ein Sof was also the power of finitude. Prior to the Tzimtzum these “Letters” were filled with Or Ein Sof and they represented only the potential for limitation. The function of the Tzimtzum was to remove the Or Ein Sof that flooded the letters so that limitation and finitude could be actualized. Hassidism compares the Sefirot as they were in the pre- Tzimtzum state to the potential of a spark from a flint stone. Even if the stone has been immersed in water, there still remains potentially the ability to strike the stone and make fire. In no way could we say that the spark has a separate identity within the stone. However, as the Sefirot emerge in the post Tzimtzum stage, they are indeed like a flame bound up in a coal. The flame definitely has a separate identity, yet its whole existence is completely bound up in the coal. In order to visualize what happened after the initial Tzimtzum, Rabbi Chaim Vittal presents the following graphic: Imagine a circle, and the circle is full of the Or Ein Sof. No finite existence may be created within this circle for the Light of the Infinite totally occludes it. The Tzimtzum concealed the Or Ein Sof so that within the circle is left a void within which something finite can be created. The next stage of creation was the introduction into this circle of a beam of pre-Tzimztum light called the Kav. Contained within this Light were all the ingredients for the creation of the various worlds. The difference between a circle and a beam of Light is that the circle has no beginning and no end. Around its circumference one can move ad infinitum. The circle represents the Infinite Light of Sovev Kol Almin (the Light that surrounds all worlds), which is peripheral to all worlds. Hassidism calls it an Or Makkif (a transcendent Light). The Kav on the other hand is a line which has a beginning and an end. The Kav represents the chain of worlds in the post-Tzimtzum state in which there are higher worlds and lower worlds, rather like the various rungs of the ladder. In the higher worlds, the Light is very intense and G‑d’s presence is absolutely manifest. As the Kav progresses, the measure of Light is reduced further and G‑d’s presence becomes more concealed within the Vessels. At the center of the circle is this world. This is the lowest point of the line at which the Light is totally concealed within the physical creation. To help understand this difficult concept, let us imagine a beam entering a circle and then creating concentric circles, rather like the layers of an onion. In our case, the circles are worlds. There are four levels of worlds, called Atzilut (emanation), Beriah (creation), Yetzirah (formation), and Assiyah (action). As the Kav enters the circle, or in our analogy, the outermost layer of the onion, the first stage is the world of Atzilut. Beriah, Yetzirah, and finally Assiyah, which is our world, follow Atzilut, reaching deeper and deeper towards the center. The entire Light of the Kav is the Light of Memale Kol Almin (the Light that fills all worlds). This Light is an Or Pnimi (inner Light), as opposed to Sovev Kol Almin which is an Or Makkif. In the teaching metaphor the purpose of Einstein removing quantum theory from his mind was to reveal elementary mathematics to the student. The process was for the purpose of revelation, so that the student would eventually progress to higher levels. The same is true of the Tzimtzum. The purpose of the Tzimtzum was not mere concealment, but also for revelation— a descent for the purpose of ascent. Through Tzimtzum a finite world was created. The Torah and Mitzvot can be likened to clothing or garments that are covering the Or Ein Sof. This world, with all its limitations, cannot contain the Infinite Light in its revealed state, but it can in concealment. Within this world one could reveal the pre-Tzimtzum Or Ein Sof as it is enclothed within Torah and Mitzvot, fulfilling the purpose of creation to create a dwelling for G‑d in this lowest realm. In terms of human history, the revelation of this Light will take place in stages. At present the Shechinah is concealed, but as history progresses into the Messianic Era there will be a greater revelation of the pre-Tzimtzum Light and even more so in the time of the Resurrection of the Dead. It should also be noted that our actions and Mitzvah performance in Exile will eventually precipitate the revelations of the Messianic Era and the Resurrection. Exile is externally a result of sin. Internally, the real purpose of Exile is to reveal “self-sacrifice” (Mesirat Nefesh) for Mitzvah observance. This acts as an arousal from below and elicits a response from above in the form of reward in the Messianic Era. Kabbalah explains the various names of G‑d. One may not pronounce the four letters of G‑d’s name as they are written due to the name’s great sanctity. We shall therefore employ the word Havaye to denote that name. The Tetragrammaton, Y-H-V-H, is composed of three words: Haya—He was, Hoveh— He is, Yihyeh—He will be. This name describes the Sovev Kol Almin. 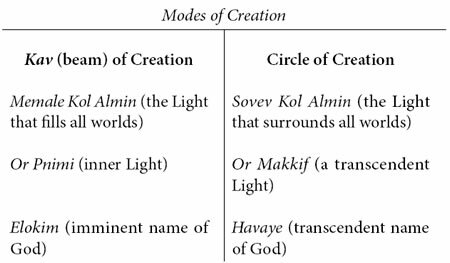 In a later chapter we shall discuss the name Havaye in a different context, as it relates to the four worlds. The name of G‑d that describes Memale Kol Almin is Elokim. The numerical value of Elokim is the same as the word “nature” (hateva), implying G‑d’s Presence within creation. Kabbalah talks of the “unification” (yichud) between Havaye and Elokim. The Torah tells us, “Know this day that Havaye is Elokim.” Hassidism calls it a unity of Sovev Kol Almin and Memale Kol Almin, seeing G‑d as both transcendent and imminent. We can now explain why G‑d first revealed the Infinite Light and why only then through a process of Tzimtzum revealed the Finite Light. The purpose of creation is Dirah BeTachtonim (a dwelling place for G‑d in the lower world). In order to fulfill this purpose, two things were necessary: the creation of a lower world and the ability of the lower world to be absorbed within the Divine. Initially, G‑d revealed the Or Ein Sof; the transcendent Light of Sovev Kol Almin . Tzimtzum revealed Memale Kol Almin. Since the latter stems from a pre- Tzimtzum Light, it always has a desire and an ability to be nullified in its source. Simply put, G‑d wants a person to live within this world and be above it at the same time. Being within is Memale Kol Almin, while staying above is Sovev Kol Almin. In the mundane activities of business pursuits, eating, etc., one should “know G‑d in all their ways.” In spiritual activities, one stands above the creation when praying or learning Torah. The purpose of creation is the fusion of the two. This is achieved only through a total “nullification” (Bittul) to Atzmut; to G‑d Himself in fulfillment of His desire in creation.